Although Patrick Macnee, who died at age 93 on June 25, is beloved for his role as the dapper John Steed in The Avengers, he made some memorable mystery appearances (such as Sherlock Holmes in The Hound of London and Dr. Watson in Sherlock Holmes in New York, Sherlock Holmes and the Leading Lady, and Incident at Victoria Falls, the latter two opposite his old friend, Sir Christopher Lee. I also recall that Lee and Macnee are two of the betters against Pierce Brosnan's Phileas Fogg in a TV movie version of Around the World in Eighty Days). Another mystery credit is Macnee's role as an actor in Rehearsal for Murder, penned by the dynamic duo of Richard Levinson and William Link (Ellery Queen, Columbo, Mannix, etc.). Costarring Robert Preston, Lynn Redgrave, Lawrence Pressman, Jeff Goldblum, and William Daniels, this TV movie features a playwright who wishes to trap the murderer of his fiancee. "The Weird Side of Detective Fiction." Indiana University's Lilly Library has a new summer exhibition, "Death by Gimmick! The Weird Side of Detective Fiction," which features the work of Edgar Wallace, Harry Stephen Keeler, and paperback publishers. In The Clouded Yellow, former secret agent Trevor Howard and Jean Simmons go on the run when the latter is accused of murder. Costars include Kenneth More and Andre Morell. The film is based on a story and screenplay by Janet Green (see last week's Cast a Dark Shadow). 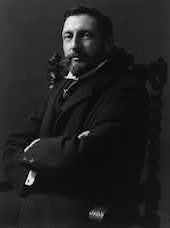 See H. Rider Haggard in his study and garden. H. Rider Haggard, c. 1905. For today's 159th birthday of author Sir Henry Rider Haggard (King Solomon's Mines, She, etc. ), you can watch 1923 footage of him working in his elegant Norfolk study, walking in his garden, and patting his dog. 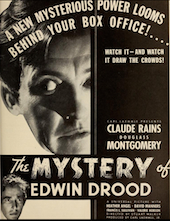 Cast a Dark Shadow (1955). 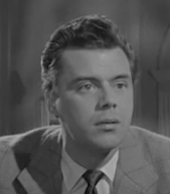 In Cast a Dark Shadow, Dirk Bogarde has a penchant for seeking spouses who appear to be wealthy and then dispatching them. Margaret Lockwood and Kay Walsh co-star. The film was adapted from the play "Murder Mistaken" by Janet Green. Tom Nolan on Ross Macdonald. On the Library of America blog Reader's Almanac Tom Nolan posts part 2 of his series on the life and work of Lew Archer creator Ross Macdonald (aka Kenneth Millar). Part 2 discusses the Canadian-influenced Millar's view of California, the state where he elected to live and set his work. 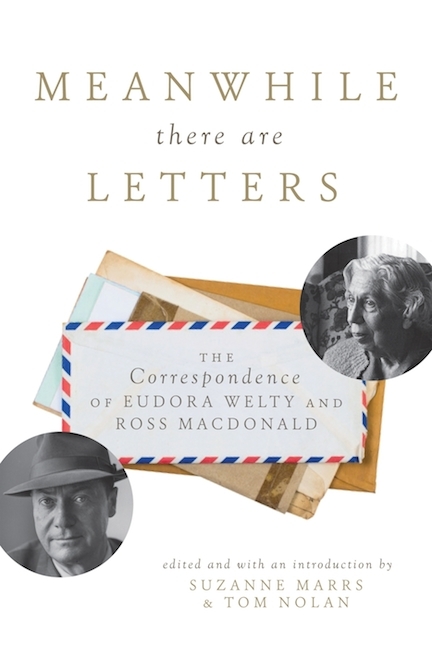 Part 1 deals with the relationship of Dashiell Hammett's and Raymond Chandler's work to Macdonald's. A Gentleman after Dark (1942). In A Gentleman after Dark thief Brian Donlevy breaks out of prison to thwart the blackmail plans of his wife, Miriam Hopkins, and protect his daughter. 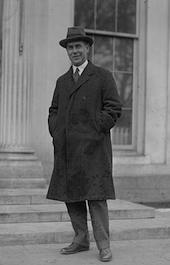 The film is based on "A Whiff of Heliotrope" by Richard Washburn Child, whose occupations included magazine editor, presidential campaign writer for Warren G. Harding, chair of the National Crime Commission, U.S. ambassador to Italy, and ghostwriter for Benito Mussolini. On view until November 22 at London's Charles Dickens Museum is the exhibition "A Dickens Whodunit: Solving The Mystery of Edwin Drood," which is curated by Clues contributor and Dickens specialist Pete Orford (University of Buckingham). It features clips from adaptations and discussions of various theories about the perpetrator in Dickens's unfinished work. Visitors can also see the desk on which Dickens wrote Drood. Orford is also involved in The Drood Inquiry, an interactive investigation into Dickens's mystery. In Another Man's Poison, Bette Davis is a mystery writer juggling an inconvenient husband, a lover, a blackmailer (Davis's then-husband, Gary Merrill), and a nosy veterinarian (Emlyn Williams). The film, produced by Douglas Fairbanks Jr., is based on the play "Deadlock" by Leslie Sands, with a screenplay by Val Guest. John Curran talks about Agatha Christie. On RTE (Ireland)'s Arena program John Curran (author of Agatha Christie's Secret Notebooks) talks about Christie's childhood, her short stories and plays, her 1926 disappearance, and the genesis of Hercule Poirot and Miss Marple.